At first thought, fruit tattoos may seem like rather frivolous designs that are simply chosen as cute artwork for inking. They can certainly be just that, but believe it or not, fruit does have a number of symbolic meanings, and most make great foundations for tattoos. 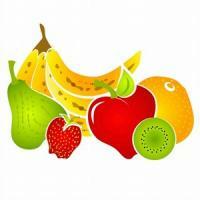 In the most philosophical sense, fruit is actually the cradle of life for a variety of plants. Fruit bursts forth from fertilized blossoms and bears the seeds that ensure each plant's opportunity for renewal. When viewed in this light, fruit tattoos are actually filled with meaning. Apples - There are few people who aren't at least a little familiar with the story of Adam and Eve. Eve was tempted to eat the fruit of the Tree of Knowledge, typically represented as the apple, and because she and Adam both took a bite, they lost their innocence and were expelled from the garden of Eden. At its simplest, the apple can be used to represent knowledge and/or temptation in a tattoo design. On another note, apples symbolize peace in some Asian cultures. Oranges - In Chinese culture, oranges are symbolic wishes of good fortune and are given as gifts with this purpose in mind. Pomegranates - Pomegranates have long been considered the fruit of royalty for their rich red color and glistening seeds. Slice one of these fruits open and you'll find it looks quite sumptuous. In Chinese culture, the pomegranate is a symbol of fertility. 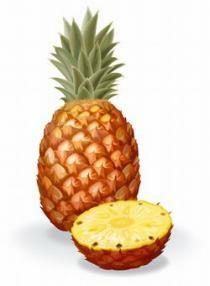 Pineapples - In Hawaiian culture, the pineapple is regarded as a symbol of hospitality. Pears - The Romans noticed long ago that the luscious curves of the pear brought to mind the figure of Venus, the goddess of love. Peaches - In some cultures, peaches symbolize immortality. Olives - Olives, and particularly olive branches are used as symbols of peace, prosperity and hope. You've probably heard the term about "holding out an olive branch" as a way to mend an argument. The biblical story of Noah and the Ark marks the end of the ordeal when a dove finds an olive branch and brings it back as a sign of land. Cherries - Cherries have a dual meaning encompassing both purity and fertility. Coconuts - Surprisingly enough, even coconuts have some symbolism. They are regarded as symbols of good fortune. Apple - How about a feminine hand holding out an apple to a masculine hand? Peach - Consider inking a peach with a bite taken out of it to symbolize taking a bite out of life and living it to the fullest. Lemons - Remember the old saying about making lemonade when life hands you lemons? If you share this optimistic viewpoint, try a fruit tattoo with a glass of lemonade with a slice perched on the edge of a glass with the words, "When life hands you lemons..."
Cherries - If you're of the opinion that "life is just a bowl of cherries", have one inked. 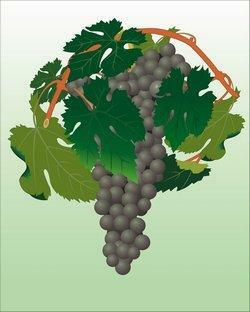 Grapes - Consider a bunch of juicy Concord grapes draped over a wine glass or goblet for a unique fruit tattoo. As mentioned above, grapevines laden with fruit can also make a beautiful piece on nearly any part of your body. Fruit tattoo "still life" - If you're a fan of the great painting masters, why not find a master tattoo artist who can bring your fruit tattoo to life? 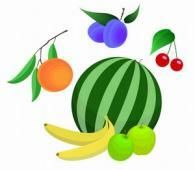 A cornucopia of fruit - A design like this can be used to symbolize an abundance of blessings in your life. You can choose fruit tattoos simply because you like the way they look, but now you know they really do carry a deeper meaning you can use to express your own thoughts.